Click on any of the images in this article to see a full-sized view. Daniel Kohn is a painter of French and American origin and has been living in New York since 1996. 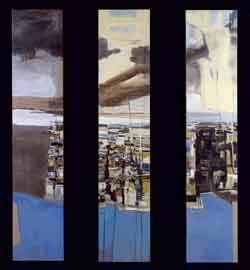 During the winter of 1998-99 he participated in the World Views residency program run by the Lower Manhattan Cultural Council which gave him studio space on the 91st floor of the World Trade Center. The work reproduced here is part of a series entitled "FRAGILE HORIZON" that Daniel has been working on since his residency in which he attempts to come to grips with the issues raised by the World Trade Center as a physical and cultural place. Originally curious about the place of the horizon in the view of New York, I found myself forced to address the particular way that view was framed and broken up by the World Trade Center's structure. (Because of its exoskeleton, the façade was divided into 10 bays of 10 narrow vertical windowseach window being 89 x 20 inches). I therefore started a series of exploratory paintings based on the 89 by 20-inch format. Rather than being a straightforward description of the view, these paintings came to incorporate rhythms of the city as well as the physical shifts in perspective which the viewer experiences as he or she moves back and forth and across these vast bays. 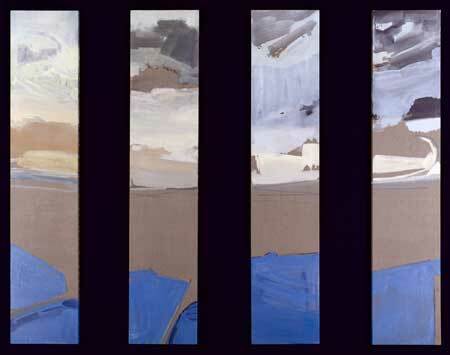 I have continued work on this series ever since my residency and was completing a proposal for the World Trade Center lobby, which would have consisted of a 35 by 28 foot multiple panel landscape (to be suspended on cables). When I saw the towers burn and then go down I did not think about art. I thought of all those people, of how long it had taken to evacuate them in the previous bombing, I felt the scream in my bones when Tower One collapsed, knowing intimately there were so many trapped inside. The physical vision of the collapse was tied for me to the physical experience of having worked there. Later, along with so many other New Yorkers, I was taken with the need to help, and the accompanying impossibility. But I also started to feel the disaster through my work, through the paintings hanging in my studio and lining my storage racks, and began to realize that their often bucolic fragility had been transformed in that instant into something else which I had no way to understand. History always transforms the way art is perceived but it doesnt usually happen this suddenly. Since then I have been trying to bring together the artists who have been through the World Views Residency to try and think through this tragedy from the particular vantage point of the work we all did in and on the World Trade Center. I have also returned to the studio and am trying to figure out where to go with my work. It is obvious that this series will go on but I cannot yet guess at the impact of the towers destruction.